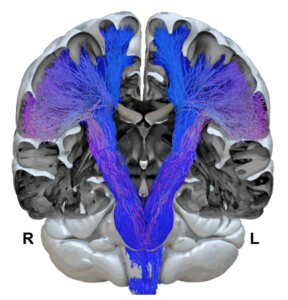 The PyT atlas (Atlas of the human pyramidal tract) is a population-based probabilistic atlas of the pyramidal tract built from diffusion-weighted tractography data in 410 individuals. 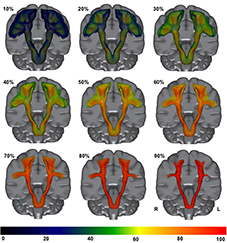 The PyT atlas covers the complete medio-lateral fanning of the cortico-spinal and corti-bulbar projections following the central sulcus convexity. Such an accurate anatomical result is due to the combination of: 1-the careful and accurate anatomical positioning of ROI in each individual; 2- the more efficient tracking thanks to the use of bundle-specific tractography algorithm. The values correspond to the frequency of voxels containing the PyT from 0 to 100% of the 410 participants. For example, 50% means that 205 out of 410 individual PyTs are included in the volume. Chenot Q, Tzourio-Mazoyer N, Rheault F, Descoteaux M, Crivello F, Zago L, Mellet E, Jobard G, Joliot M, Mazoyer B, Petit L (2019) A population-based atlas of the human pyramidal tract in 410 healthy participants. Brain Structure and Function.